Maximus, the world’s largest tourbillon cage measures 27 millimeters across. 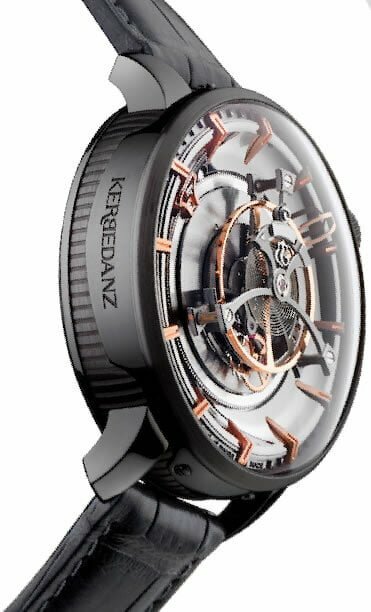 With its 27-millimeter cage, which is almost twice the size of the largest one known to date, the biggest wristwatch with tourbillon in the world, by KERBEDANZ, couldn’t be called anything but Maximus. Indeed, the most imposing monument of all of Roman Antiquity is still in Rome to this day and is called the Circus Maximus in Latin and in Italian. This famous venue was used for horse-drawn chariot races. It was built between the Palatine and Aventine Hills in the early 6th century B.C.E. by the Etruscan king, Tarquin the Elder. This unbelievable watch, which transcends this seminal complication in a technically impeccable and visually most spectacular manner, represents a watershed in the story of this top-flight brand, KERBEDANZ, which has been winning over more and more informed collectors and MIP – most important personalities – from its home base in Neuchâtel, Switzerland. This term, in contrast with the hyped term, is a discreet reference to the fact that the brand’s customers include individuals who have the most influence in the world, like statesmen and – women, in other words, people with power and influence. 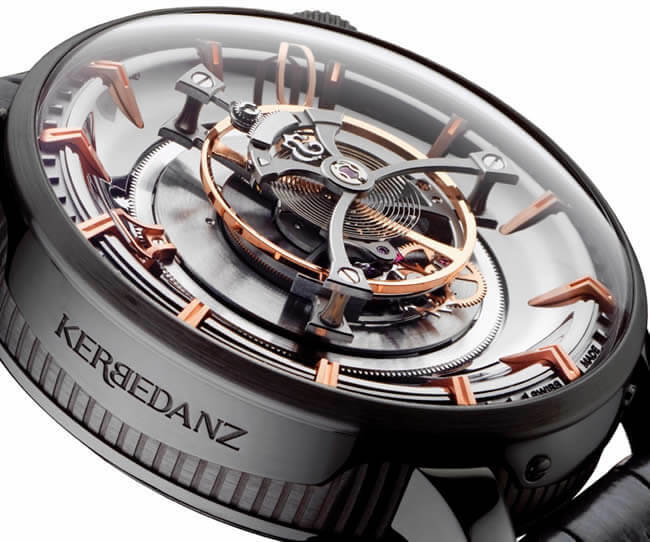 It’s an important watershed because until now, KERBEDANZ revealed its multiple crafts inherited from a long family tradition in the field of jewelry in the extreme luxuriance of its dial decoration, which always features a host of allegories and initiation journeys combined with stylistic civilizational references to history. All those limited editions or unique pieces might easily conceal the fact that the brand also integrates the quintessence of the art of traditional Swiss horological complication, and that it is able to develop the most complex products using the science of chronometry. The tourbillon was invented by the great watchmaker Abraham Louis Breguet (1747-1823. The complication places the regulating organ of the watch inside a cage that turns on itself, thus varying the position of the regulating elements to compensate for errors due to gravitational forces, to non-concentric development of the balance spring, and the point where it is attached to the collet. In watchmaking, enlarging the size of certain components does not mean just multiplying their size. Everything needs to be reinvented, recomputed. Two patents are pending. 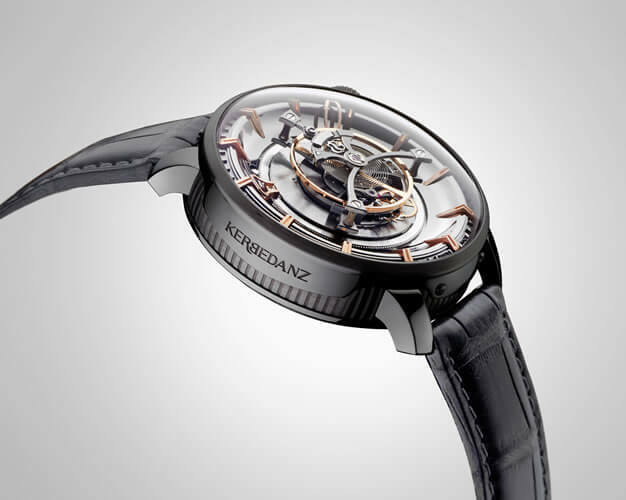 Not only does the Maximus flying tourbillon by KERBEDANZ allow one to better observe and understand the subtleties of this fascinating mechanism, thanks to its sheer size, but it also demonstrate the extent of the company’s watchmaking competencies: This watch required conception and manufacturing of a special balance spring, a rack with a screw for fine adjustment, and a balance wheel. The cage of this watch makes a full rotation once every six minutes, and not in sixty seconds, which is usually the case. At Baselworld 2017, the beauty shown by KERBEDANZ by the world debut of the Maximus is not only symbolic. It has all the esthetic opulence emanating from meticulous watchmaking balance and scrupulous finishing, like the superb hand-polished beveling, the drawing of the watch’s flanks, the circular-grained wheels, or the mirrorpolished screws. As for the name Maximus, it has a long pedigree and is also steeped in allegorical meaning. It not only celebrates the high priest at the head of the College of Pontiffs, the religious figures at the heart of Rome’s state religion who were in charge of the calendar that indicated propitious and unpropitious days, of consecrating buildings, naming other priests, like the flamines and the vestal virgins, and maintaining the Roman archives containing the notable events in the “Great Annals.” Maximus was also the title granted systematically to all the Roman emperors during the period following the reign of Augustus. Maximus, in antiquity, was a key word wherever grandeur and splendor were being expressed. In 2017, the term has taken on a new, masterly dimension, one made up of a respect for watchmaking fundamentals, combined with a bold quest for watchmaking excellence. A significant opus, and an inescapable one as well. Caliber KRB-08, with giant central flying tourbillon, in-line pallets, in a 27-millimeter cage making one rotation every six minutes. Four barrel springs in parallel driving a central wheel mounted on ball-bearings producing the torque to supply a tourbillon of such size. Over 48 hours of power reserve with indicator. A total of 415 components, tourbillon cage entirely of titanium, made of 73 components, weighing 1.35 grams. Movement diameter: 40 millimeters. Movement height without the cage, 8.35 millimeters; with the cage 13.2 millimeters. § The tourbillon allows the regulating parts of the watch to rotate, thus achieving different positions to compensate for errors due to gravitational forces, to the nonconcentric development of the balance spring, and to the point where it is attached to the collet. § Due to its spectacular size, the tourbillon can be observed and its functioning better understood. 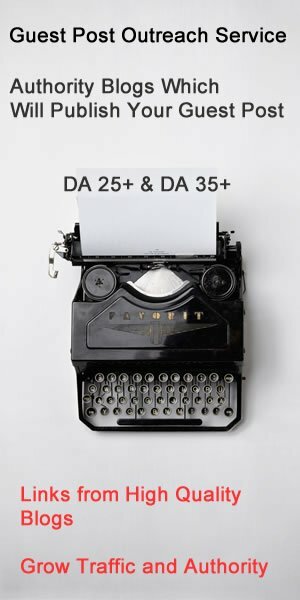 § The competencies required are the following: design and manufacturing of a balance spring, a rack with a screw for fine adjustment, and a balance wheel. § Haute horlogerie decoration with polished chamfering, drawing of the watch flanks, circular-grained wheels, mirror polished screws. Titanium, platinum, 18-karat rose gold, 49 millimeters in diameter. Designed and manufactured by KERBEDANZ. Sapphire crystal and exhibition case back with antireflective treatment. Water-resistant to 3 atmospheres (30 meters), time-setting crown at 2 o’clock and centralized winding using case back. Gold. Exclusively designed, manufactured, hand- decorated by KERBEDANZ. Alligator mississippiensis skin or rubber, 18-karat gold buckle personalized by KERBEDANZ.